You are here: Home » Encouragement for B.O. (Born-Organized) Moms … yep, you need it too! Encouragement for B.O. (Born-Organized) Moms … yep, you need it too! 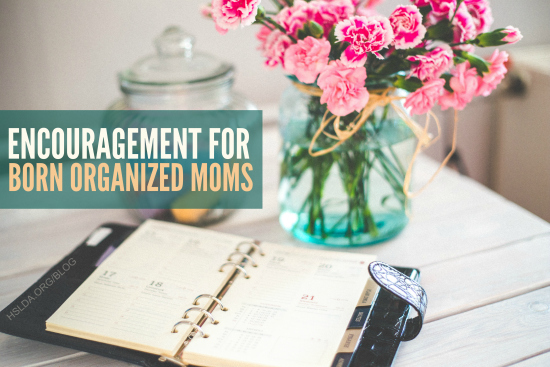 Last week I shared some words of encouragement for moms who, because they are gifted in relational ways (people oriented), tend to be less task-oriented and therefore, less organized. However, they are not the only ones who need a good word. B.O. moms do, too! Being naturally more organized (though at times I can be really efficiency-challenged—“Oh, look, there’s a great book I haven’t read to my kids yet!”), I often wished I could be more like my husband, who was people-oriented—in a big way. He loved being around people 24/7. Now you know why we had seven children. I felt like the constant desire to pick things up as I walked through the house to put them away meant something was very wrong with me. I admit, I did have a hard time focusing on what my kids were saying to me when I was in their bomb-zone bedroom—clothes, toys, papers, projects … everywhere. Kaboom! However, after reading the excellent book, Different Children, Different Needs, by Dr. Charles Boyd, I came to realize that God wired humans to be both people-oriented and task-oriented. One is not better than the other, and both types of people reflect His character—God Himself is both, completely and in perfect balance! As a result of my reading and reflecting, I tried to grow in slowing down, engaging in listening, serving, and just hanging more with my kids. I also tried to accept that God made me with organizational strengths and they can be and are used for His glory. With God’s help, I feel living in balance between the two was attainable. Challenging? Yes, but at least possible. If you are a B.O. (born-organized) mom, you may have had some of the same feelings as me. Please know there is encouragement for you, and some good things to keep in mind as you raise and train your children, and run your home and homeschool. 1. DO GIVE UP CONTROL!—it’s easy to gain your identity and a sense of security from being organized and “in charge” of your home. It can be tempting to feel good when all the toys are picked up, your desk is clear, and your windows sparkle. Remember though, while it is easy perhaps for you to clean and organize your home, God looks on the heart. While we are to reflect His character of orderliness, He cares more about the time we spend making sure the nooks and crannies of our hearts are clean and pure before Him. Treasuring Him in the midst of keeping our homes and trusting Him for how our home looks and how our day goes, brings Him much glory. Especially when it’s a sacrifice on our part to practice these things. 2. FOCUS ON FAITHFULNESS—as an organizer or “cleanie,” you may be tempted to place things above people. God wants us to focus on faithfulness in little things as Luke 16:10 tells us. This might mean wiping a child’s nose (again and again), reading a favorite story for the 12th time, or rocking a sick baby in the wee hours of the morning (with God’s help, of course). God will enable you to do all you need to in your home if you are willing to surrender your time to Him to do whatever He asks of you in other areas of being a mother. 3. KEEP YOUR PERSPECTIVE—while we are given stewardship responsibility over our sphere (our home), everything we have is given to us “on loan,” as Psalm 24:1 reminds us, “The earth is the Lord’s and the fullness thereof.” Our citizenship is in heaven, which helps us to fight the temptation to idolize or try to hang onto the things of this world we are given. Remembering that, in Christ, our true home is in heaven encourages us to have our treasures there, too (Matthew 6:19-21). Finally keeping in mind that, no matter how hard we work to organize and make our homes beautiful, we still live in a fallen world. This realization will help us B.O. moms to let go of perfection. There will never be a perfect home, a perfect schedule, or a perfect homeschool. Those dirty shoe marks on the floor, interruptions, broken appliances, and scattered toys serve to remind us that we must find our security and joy, not in the things of this world, but in God and in loving the family and people He has placed in our lives. Do I still dream about having a totally clean home? Rooms that would look good on a Pinterest board? Of course I do! But this cleanie mom dreams more about having family hearts knit together by the love of God and passion for living to the glory of His name…just don’t look too closely at the fingerprints on my fridge and everything will be alright.